FILE - South Korean President Moon Jae-In. South Korean President Moon Jae-in said on Tuesday that next year’s joint military exercises with the United States may be postponed until after the Olympics. 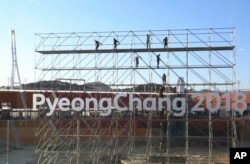 A Blue House presidential official in Seoul clarified on Wednesday that delaying the joint drills would be contingent upon North Korea restraining from carrying out any provocations during the 2018 PyeongChang Winter Olympics that are to be held in South Korea in February. President Moon said a pause in provocations would help create a “conducive atmosphere towards inter-Korean as well as U.S.-North Korean dialogue." Tillerson had earlier said the United States was prepared to engage in unconditional peace talks with North Korea, but after being rebuked by the White House, he clarified that Pyongyang must first earn its way into negotiations by refraining from further provocations. In the last two years North Korea has accelerated its missile and nuclear development program, and last month announced it had achieved operational capacity to target the U.S. mainland with an intercontinental ballistic missile. FILE - The Pyeongchang Olympic Stadium under construction in Pyeongchang, South Korea. The Moon administration has dubbed the upcoming games the “Olympics for Peace,” and his government has been urging North Korea to participate, to both help ease regional tensions and facilitate dialogue. Critics doubt North Korea will change its defiant behavior in response to Moon’s outreach. “I think all this focus on the Olympics as an opening for diplomacy and peace is very much wishful thinking,” said North Korea analyst David Straub with the Sejong Institute in South Korea. South Korea hopes that hosting a successful and peaceful Olympics will showcase the democratic and technologically advanced nation and generate billions of dollars for the economy. A multi-billion dollar high-speed train from Seoul to PyeongChang was recently completed as part of a larger infrastructure initiative for the games. FILE - South Korean army soldiers get off a truck during an anti-terror exercise as part of Ulchi Freedom Guardian in Seoul, South Korea, Aug. 18, 2014. A possible delay to the U.S./South Korean joint military drills could be seen as a trial run for a Chinese and Russian proposal to suspend the joint exercises in return for North Korea halting further nuclear and missile tests. 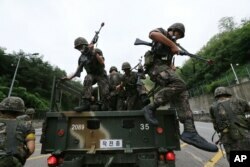 The United States and South Korea regularly hold military exercises to prepare for possible conflict with the North. The Key Resolve and Foal Eagle exercises that are held in the spring involve about 17,000 U.S. troops and more than 300,000 South Koreans. Neither Washington nor Pyongyang has agreed to the freeze proposal. The United States contends that conventional military drills are legitimate defensive maneuvers, as opposed to the North’s nuclear and missile tests that have been banned by United Nations resolutions. 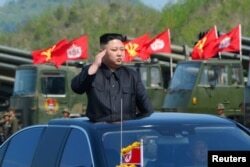 North Korea refers to the U.S. military drills as rehearsals for invasion, and maintains its nuclear program is needed to defend against the American forces. Delaying the joint drills could also help improve relations between Seoul and Beijing that have grown contentious over South Korea’s deployment of the U.S. THAAD missile defense system. China objects to the system's powerful radar that can potentially see far into its territory. FILE - North Korea's leader Kim Jong Un inspects artillery launchers ahead of a military drill marking the 85th anniversary of the establishment of the Korean People's Army (KPA), April 25, 2017. Since taking office in May, the liberal South Korean leader has tried to balance engaging the Kim Jong Un government to improve relations, with supporting strong economic sanctions to pressure the North to give up its nuclear weapons program. Straub said many in the Moon administration want to recreate the Sunshine Policy instituted by South Korea in the early 2000s, that provided unconditional aid to the North but ultimately failed, critics say, to persuade Pyongyang to end its hostile behavior and give up its nuclear program. “The Sunshine Policy was supposed to be nice to the North Koreans in the hopes that eventually they would be nice to our side. And it is quite clear by what the North Koreans have done, especially in the past few years, that that is not their intention and not what they’re going to do,” he said. The North Korean Olympic Committee missed the Oct. 30 deadline to register for the winter games, but the International Olympic Committee has indicated it is still not too late. Two North Korean skaters are the country’s only athletes to qualify for the winter games so far. Pyongyang has also rejected past offers from Seoul of humanitarian aid and to cooperate to host reunions for families separated by the division of the Korean Peninsula.